When eggplant is on sale at Treasure Island it's a no-brainer for me to grab one. I wanted to use the dried mango that has become a new favorite with it, so I decided to switch it up and use triple sec and coconut milk to give it a little Asian flair instead of my usual vegetable broth and sherry. I was out of both pistachios and walnuts so I used toasted slivered almonds to provide much-needed crunch and texture. This made a satisfying meal all by itself for me, but it would pair quite nicely with meat, especially lamb. Heat the oil over medium-high heat in a large skillet. Add the eggplant in a single layer, cut sides down. Do not overcrowd the pan; cook in batches if necessary. When the cut sides are browned, turn the eggplant and brown the other sides. When all of the eggplant is browned, return it all to the skillet. Remove the pan from the heat and add the triple sec. Let it cook for a few seconds and then add the coconut milk and enough water to thin it into a sauce. Reduce the heat to a simmer, cover, and cook for 20 to 30 minutes, until the eggplant is thoroughly soft and you can easily cut the skin with a fork. 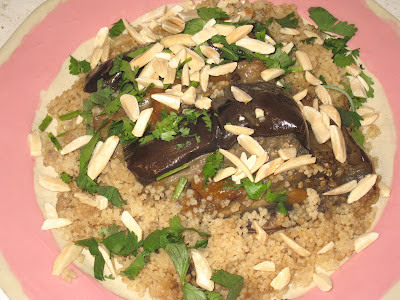 Reduce the heat as low as possible and simmer, uncovered, while you prepare the couscous. Bring the water and the remaining chopped mango pieces to a boil in a small saucepan. Add the whole wheat couscous, stir once, cover and reduce the heat. Simmer for 2 minutes, then turn off the heat and let the pan sit for five minutes. Remove the cover and fluff up the couscous with a fork. Serve the eggplant over the couscous, garnished with the chopped cilantro and slivered almonds.